Today I introduce E.M. Swift-Hook, a British writer from the North-East of England and author of the Fortune’s Fools series of space opera books. Her first trilogy of the series, ‘Transgressor’ came out last year. 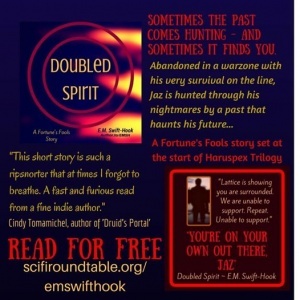 E.M. is also one of the founding members of the facebook group ‘Scifi Roundtable’ and has been instrumental in helping many authors polish their work and achieve their dreams. Thanks for asking me along today, Cindy. Right now I’m just bringing out the first book in my new Haruspex Trilogy, which is set mostly in a megatropolis dominated by criminal syndicates, called the ‘City. The book is called ‘Trust A Few’ and it includes a couple of characters which will be familiar to anyone who has read Transgressor and some new friends and enemies for them. But Haruspex is very much a ‘stand-alone’ story, so if you have not dived into Transgressor, you can start with Trust A Few instead and hopefully enjoy the story just as much as someone who has. I have so many! But my top one for sci-fi would have to be the Blakes 7 universe. There are definite tributes to that universe in Fortune’s Fools and it has to remain one of the founding pillars of my inspiration. I’m not sure I can think of any specifically, although obviously all anyone writes about human relationships has to be drawn from real or vicarious life experiences. But I did draw on real life as inspiration for the plight Charis finds herself in when she faces deportation and has to leave her home and foster mother in the high-tech Central worlds as she is longer a lone child refugee. I am not entirely sure they come from a specific place, more a generic blend of the stories I absorb, life as I witness and experience it, and the way the ambitions and motivations of my characters interact with the universe in which they live. Have we got a few hours? Where to begin? There are some really amazing indie authors out there, people like Leo McBride, Jane Jago, Eric Michael Craig, Warren Dean, Brent Harris, Bonnie Milani, Kat Caffee, Robert Lee Beers and Chrys Cymri – the list goes on. I’d probably head into the future a couple of hundred years or so – not too far, but enough that all the upcoming technology should have become embedded in society. I think going too far into the future would be too disorienting to even a sci-fi writer. As for means of transport, I don’t think I’d mind, as long as I knew it was safe. Well I would enjoy meeting my own characters quite a lot, as long as they didn’t know I was their author or it could get very messy. So maybe I’ll just go for four – the main characters in ‘Trust A Few’: Durban, Jaz, Charis and Avilon. Not sure how well we would all get along though, we don’t really have a lot in common. The next project is bringing out ‘Edge of Doom’ and ‘A Walking Shadow’, the final two volumes in Haruspex Trilogy, hopefully by the end of the year. You can follow my author page on Amazon, or if you want to keep up to date with my projects please subscribe to my blog. Thanks for having me here, Cindy, and I must say you have some really fascinating articles on this blog. I was reading through the ones about what people might eat in a fantasy world, intriguing ideas. Can’t wait for Druids Portal to come out and see how you’ve put all this research and fantasy together. Always great to get to know new writers. Thanks for posting this! thanks for stopping by! I will probably make a regular thing of author interviews as this one has been so well received.